Download our Partner App and study a Professional Culinary course on your Phone, Tablet or Computer, 24/7. Learn first hand from our expert Head Chefs, as we provide Live Video Conferences in most of our courses. We provide internationally recognised qualifications, including City & Guild and NZQA courses. 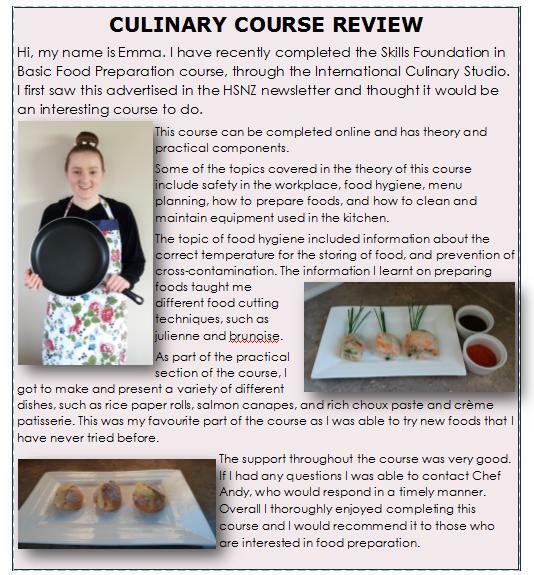 Our Interactive courses include Peer Reviews, Group Reviews & if you like a peers cooking creation – then LIKE it! No other Online Culinary School allows you to receive so many different types of qualifications and accreditations. Work as fast as you want. Receive unlimited access to an exclusive culinary library, as well as 100’s of recipes & videos. Study this programme if you are looking to work in food preparation or just started out. Boost basic skills and knowledge to progress in your career and perhaps become a chef. Study this programme if you are working in the kitchen and have some relevant knowledge of basic principles and skills, usually from a role where you’ve been supervised. The aim of the programme is to develop the skills and knowledge in basic principles of kitchen work, health and safety, and communication. It will enable candidates to develop the practical skills, knowledge and attitude required to work and progress within the culinary industry. Graduates will be prepared for employment as employees for the hospitality sector who are able to work as chefs in intermediate positions producing complex dishes in a commercial kitchen. This programme aims to develop the learner’s abilities in researching, planning, developing, implementing, and analysing of food products, recipes, and menus which ensure advanced practice in food preparation, cooking and presentation. Designed with the global trend of Café culture in mind, this course will give you all the tools you need to thrive in the vibrant Café scene. In this short course you will learn how to bake a wide variety of basic cakes & sponges including professional cake decorating. Learn about how to create diets for Coeliac, Vegan, Vegetarian, Gluten Free, Restricting Sodium, Diabetics, Cholesterol and Weight Loss. Learn everything you have ever wanted to know about the creation of bespoke chocolates – no experience necessary! The registration process was easy. The learning material is very useful. What I like about the assessments is that there is feedback from the Instructor in which my errors and areas for improvement are pointed out to me. I have used International Culinary Studio to improve the skills of myself and my staff. And I have always found their courses of great value and very user friendly. Alongside is a review of our Home school course that Emma wrote. Accreditation confirms that NZQA considers International Culinary Studio capable of delivering an NZQA approved programme.